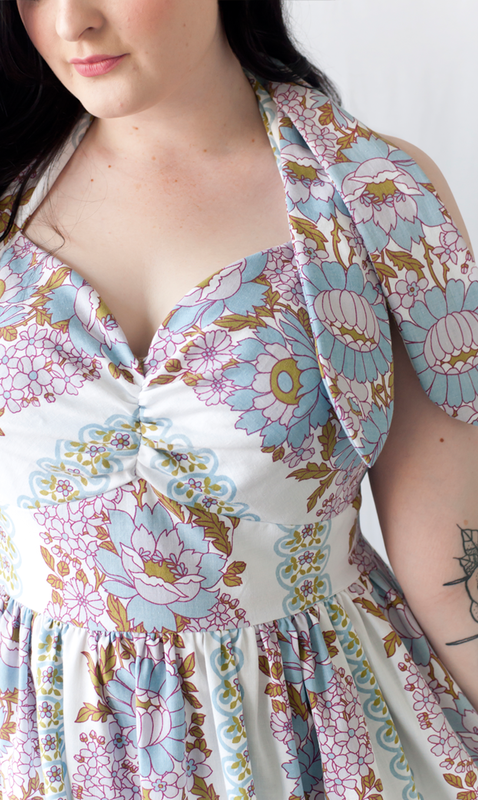 Something a little different today, my Summer sewing round up! Right now I'm planning my handmade Autumn/Winter wardrobe, so I thought as September is coming to an end that I would do a little round up of my highlights of Summer sewing and what I've learnt so far on my dress making journey. 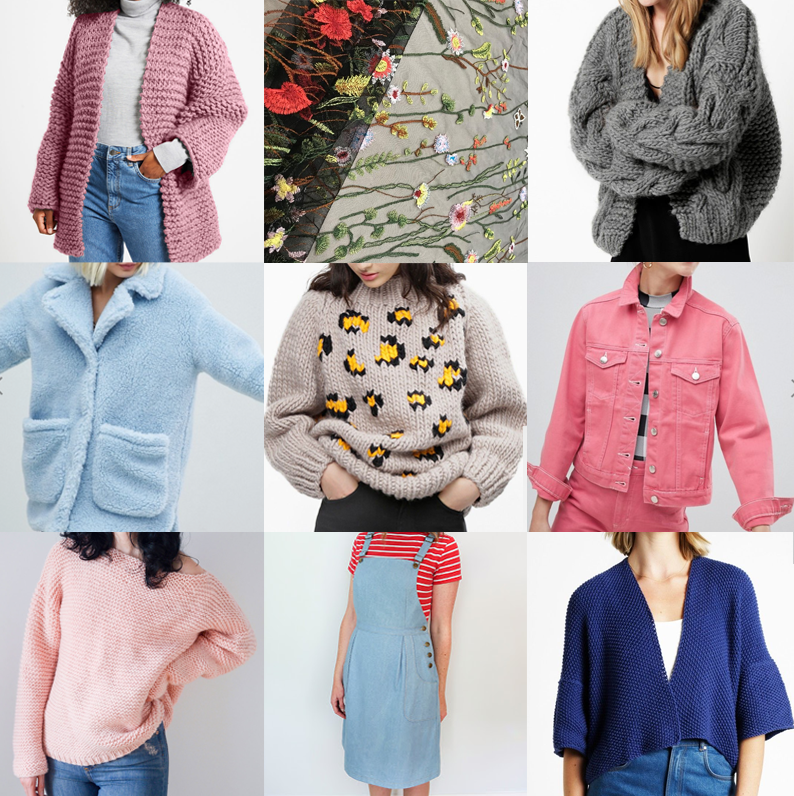 I only started my blog and regularly sewing for myself back in April but I feel like I've been making a garment for myself every week since then! At the beginning of the year there was only one handmade piece in my wardrobe, a very poorly made Lilou dress, but I was still proud of it at the time none the less! But fast forward 6 months and my rail is bursting with handmade pieces that I love to wear and feel really proud of. Along with a whole selection of new handmade clothes, I feel my skills & knowledge have improved dramatically. Starting a sewing blog has totally inspired me to be creative, it spurs me on to keep sewing for myself but having this little bit of selfish sewing time has really improved my mood and work/life balance. (I'm self employed & sew for a living at My Retro Closet, so taking the time to make something for myself every week or so has been wonderful). 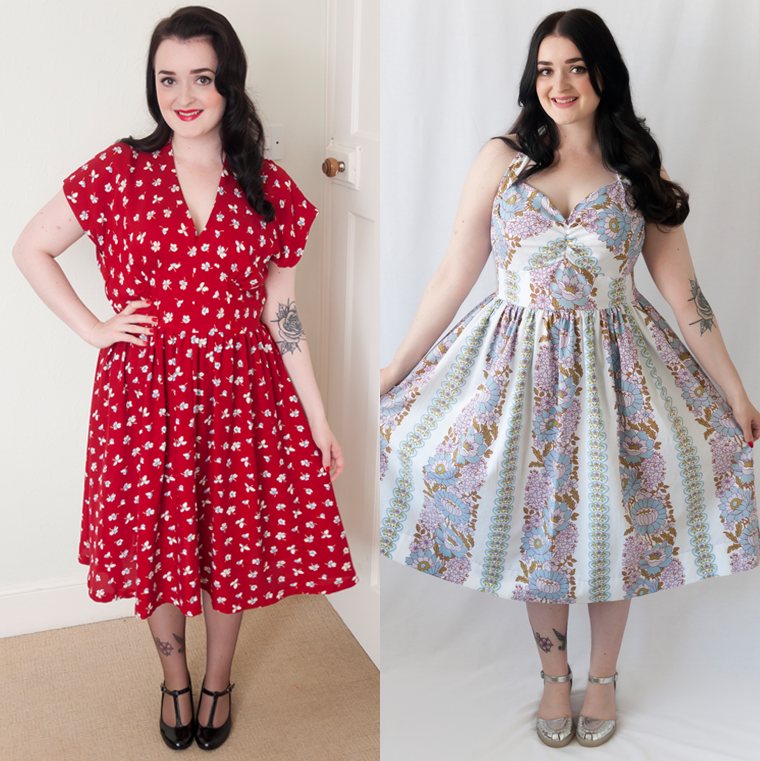 So with approximately 20 new handmade pieces in my wardrobe, let me show you some of my favourites from the Summer! 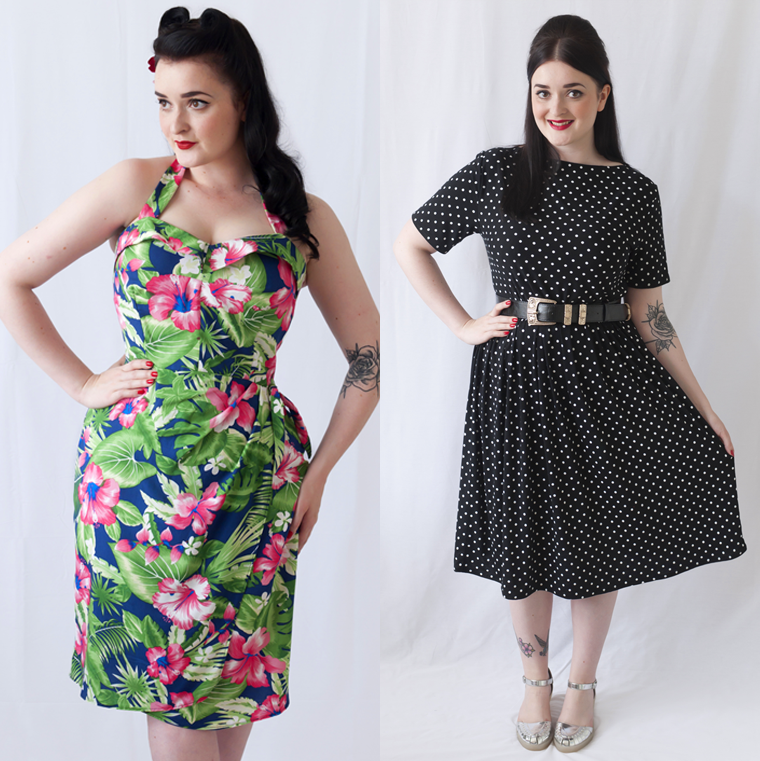 Retro Butterick '53 B5708 - Shoulder Tie Dress & Butterick B5930 - The Ultimate 50s Party Dress! It wouldn't be Summer without a load of bright and beautiful florals! I love this shoulder tie dress from 1953 and this super Mad Men style dress (that collar is my fave!). Although I never did get an invite to any glamorous garden parties! Burda Style 7179 - Vintage Style Shirt Dress & Simplicity New Look 6180 - #Ginghamalong Shirt Dress! 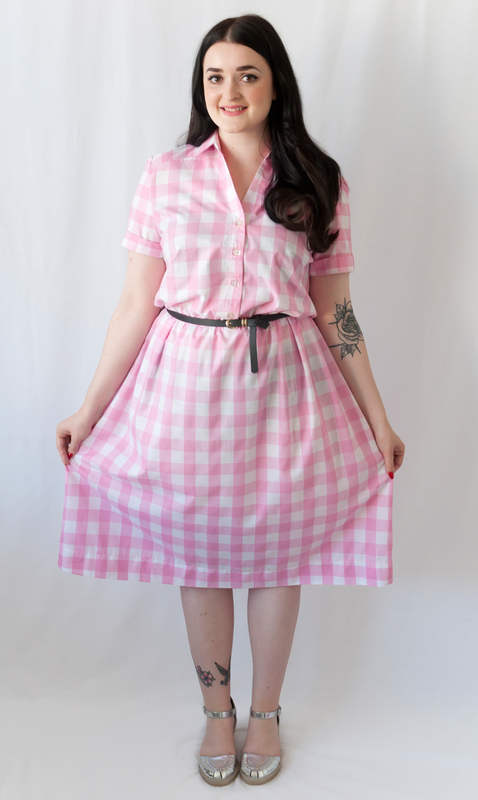 I'm shirt dress and gingham obsessed. I love the Burda pattern but definitely need to make this again with a waaaay softer collar. And on the right is one of my latest makes, my Summer staple style! Also this is the contrast between my first ever pattern review and one of my newest! These are two of my new favourite sewing skills. I like to think of myself as a collar sewing pro now after all the shirt dresses I've been sewing. 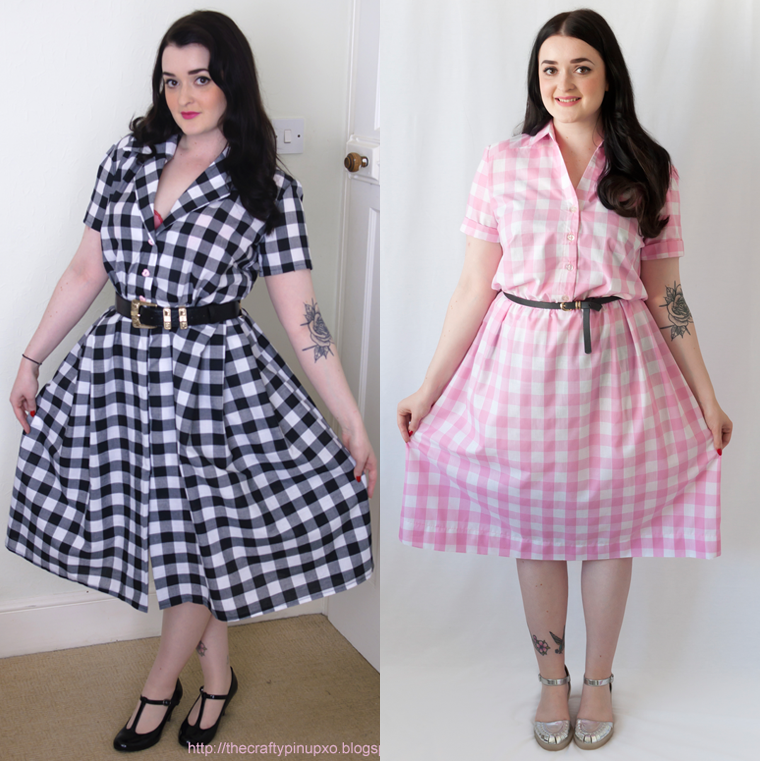 I loved the curved styles of the Sew Over It pattern and the simplicity of the Tilly one. Both I want to make again ASAP. Self covered buttons and button holes are also fun new skills in my bag, both of which I used on these makes. Butterick Patterns by Gerite B6354 - Bustier to Skirt Pattern Hack! 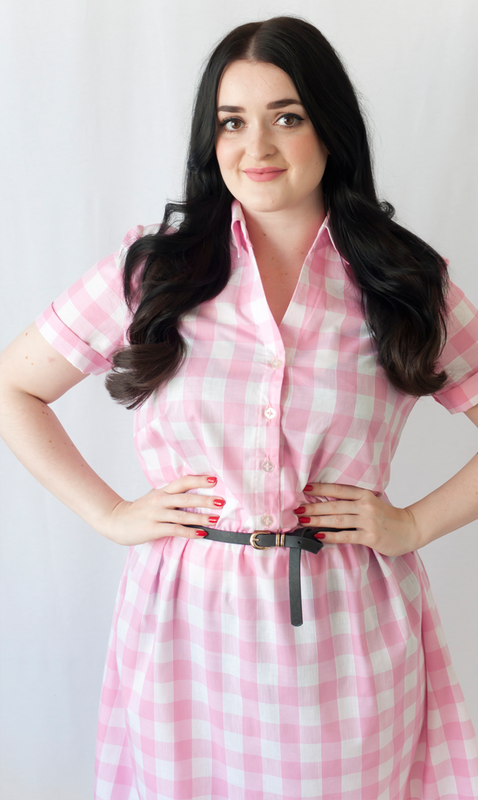 #RetroTikiCollab & Jennifer Lauren Handmade - The 'Gable' Top to Dress Pattern Hack! 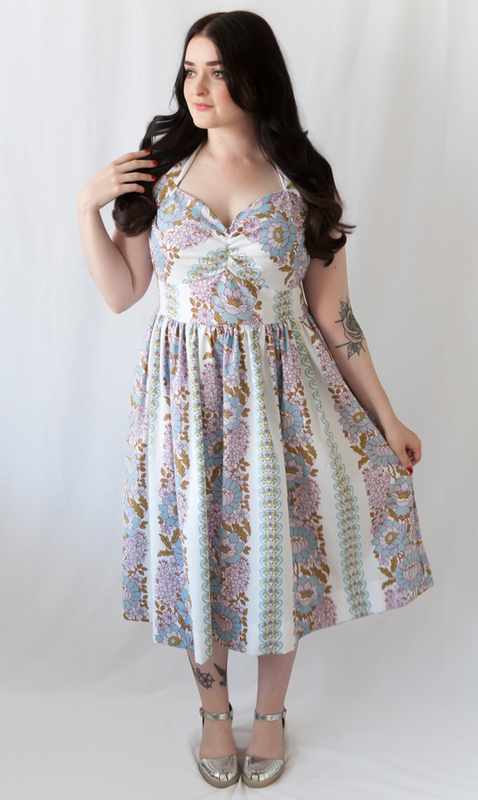 The Retro Tiki collab was so fun to be a part of and started me on my pattern hacking journey! This dress is still the sassiest thing I've ever made! 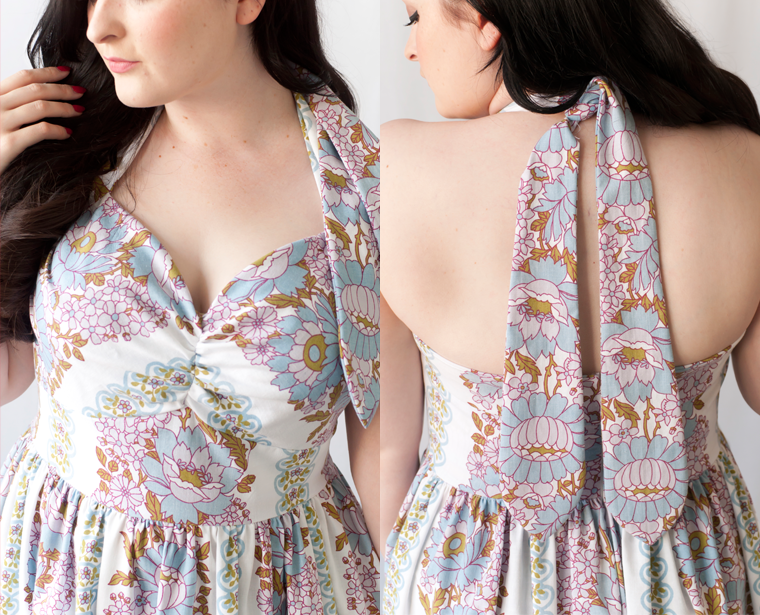 And this Gable dress is one of my most worn handmade items, so comfy and cute! I'll be making more. 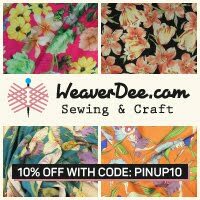 When I started my blog, I had no idea that this amazing sewing community was out there! I've met some truly wonderful people and feel constantly inspired by the work of others. So when I saw any kind of sew along with a vintage edge, I jumped on board! They've been so much fun and pushed my sewing skills and got me out of my comfort zone. Here's to lots more! 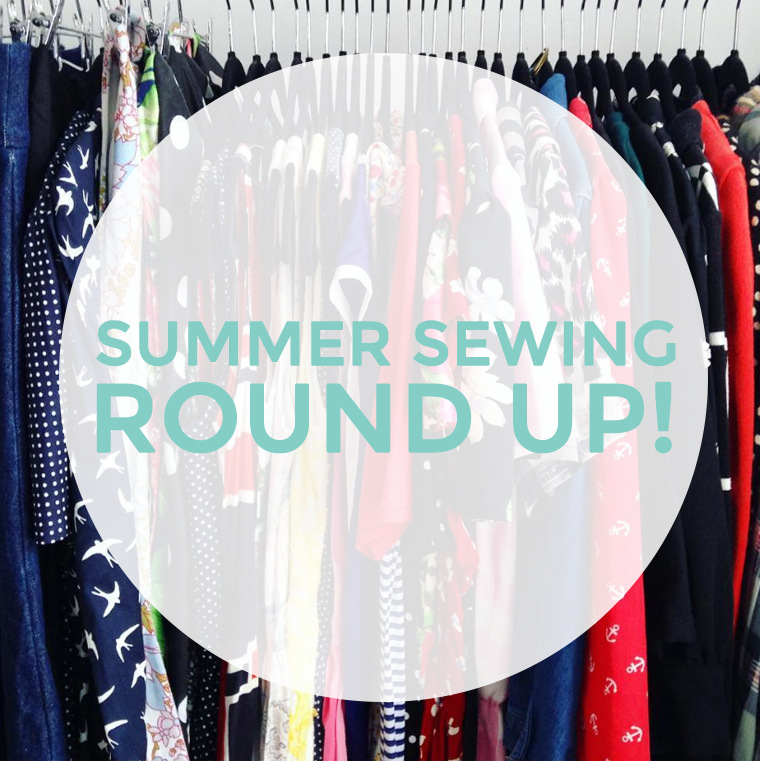 I hope you've enjoyed my Summer Sewing Round Up! I also just want to say a HUGE 'Thank You' to everyone who has followed my little blog or taken the time out to comment on my posts. 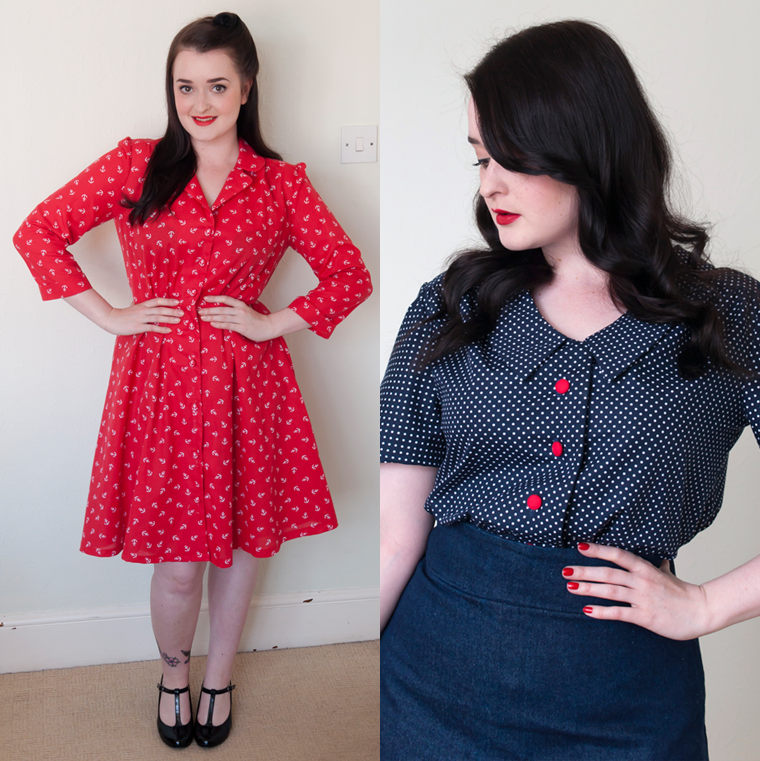 It still baffles me anyone would be interested in reading my sewing ramblings! 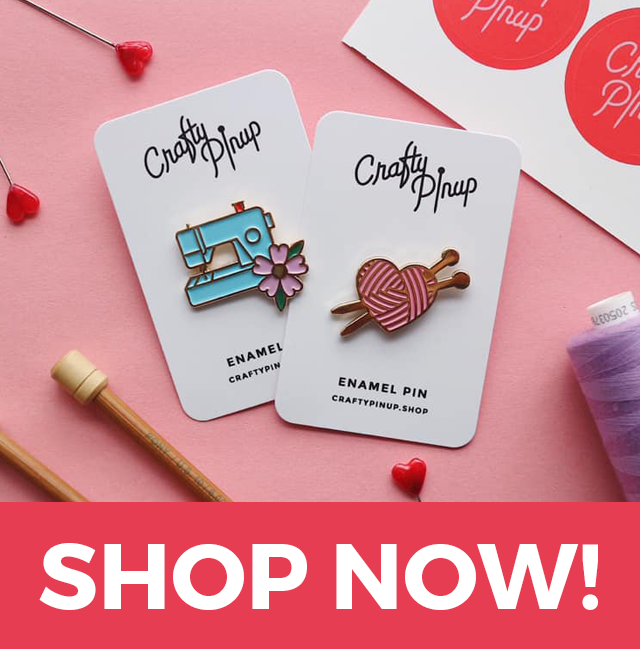 And another huge thank you to the wonderful haberdasheries and pattern designers who I have collaborated with so far, half of these makes wouldn't exist without you! 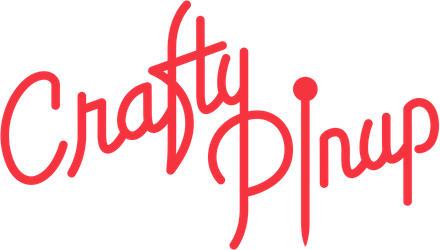 Thanks for reading, pinups! Stay tuned for an Autumn sewing plan blog post too. 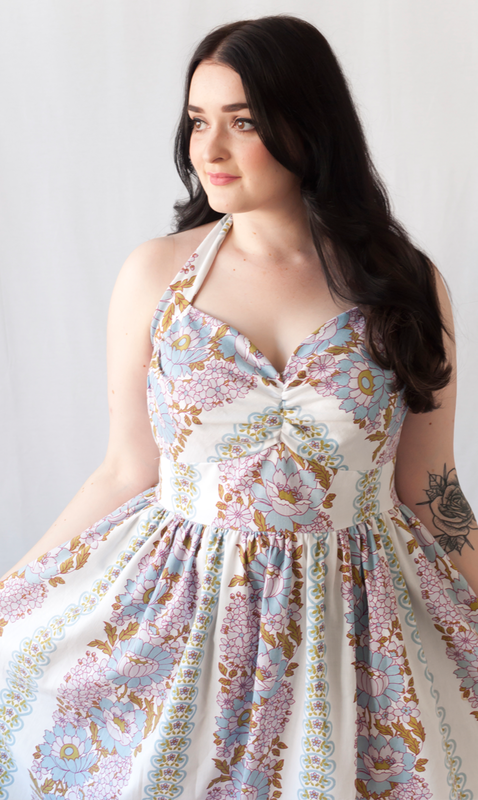 My finished Simplicity 1365 top to dress pattern hack! The Simplicity 1365 halterneck top pattern probably isn't a pattern I would have chosen myself. Firstly, 1970s is never an era I've been particularly interested in style wise (even though I wouldn't mind looking like a Charlie's Angel!) 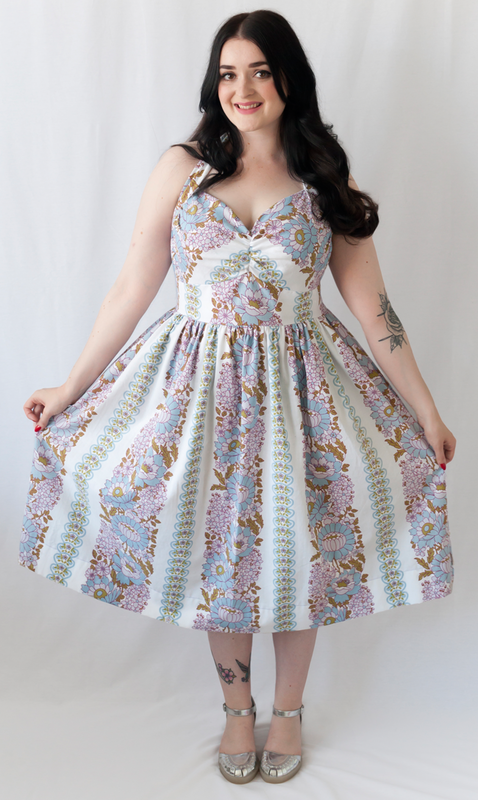 and I tend to look more for 1950s style dress patterns in the Summer. But I'm so glad I've now sewn with this pattern and my eyes have been opened to a whole new decade! Even though the pattern is a vintage reproduction of a 1970s pattern, I knew I could give it a classic 50s twist which the simple halterneck option can easily lend itself to. But then I did have a little brain wave. A few months back I was trawling eBay for vintage fabric and I came across a gorgeous vintage 1970s (good condition & laundered) double bed sheet with a stunning floral stripe print. £10 later and watching like a hawk, it was mine! So Simplicity 1365 from the 1970s plus my vintage 1970s bed sheet, sounded like it was meant to be for The Simplicity Sewing Challenge! Here's a snap I shared on my Instagram mid-make! Luckily, the bed sheet really was in good condition and I wanted to show off as much as I could of the beautiful retro print as possible. I decided my take on the halterneck top pattern would be turning it in to a dress! Another hack, I know. I used the pattern for version C - the simple, no collar halterneck with a high button up back. Looking at the pattern design and having a good read through of the instructions, it seemed simple enough to attach a simple gathered skirt and insert a concealed zip down the back. Luckily I was right! Tried a touch of pattern matching throughout! So, let me tell you how I hacked this pattern! Along with the Simplicity 1365 pattern you'll need a self drafted gathered skirt pattern. I used this for my Lilou dress and my Gable dress. 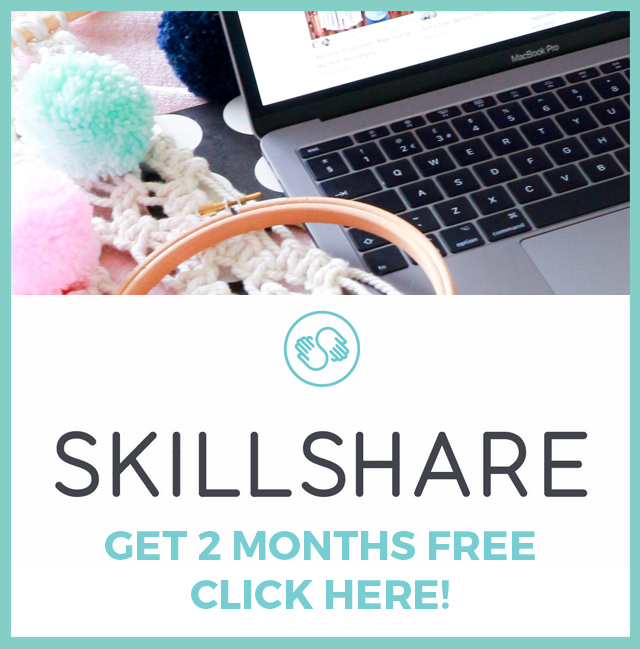 If you haven't made one for your patterns stash yet, you need to! I followed the instructions from Tilly and the Buttons Love at First Stitch book. Cut out all pieces for the C version halterneck top along with your self drafted gathered skirt. Continue to Step 15 and finish at Step 19. Sew skirt side seams and gather. Lie the skirt over the bodice pattern and pin in place matching seams. Much like you would when attaching any skirt to a bodice in a dress pattern. Sew skirt to bodice. Insert concealed zip down the center back using your preferred method. I'm so happy with how my pattern hack turned out! I tired to pattern match as much as possible and I like how it's worked out against the skirt and bodice waist seam. I think it really shows off the print of the fabric, just how I wanted. I found the top reasonably easy to sew. The instructions and illustrations were pretty clear and it didn't take too long to whip up! I did have to take a bit out of the back to get it to fit nicely and securely, but over all I'm happy with the fit. I have quite a large bust so I wanted to make sure the cups of the halterneck were actually in the right place and not too short. So I cut out a generous size to enable me to alter the fit around my waist and back towards the end and it worked out fine. 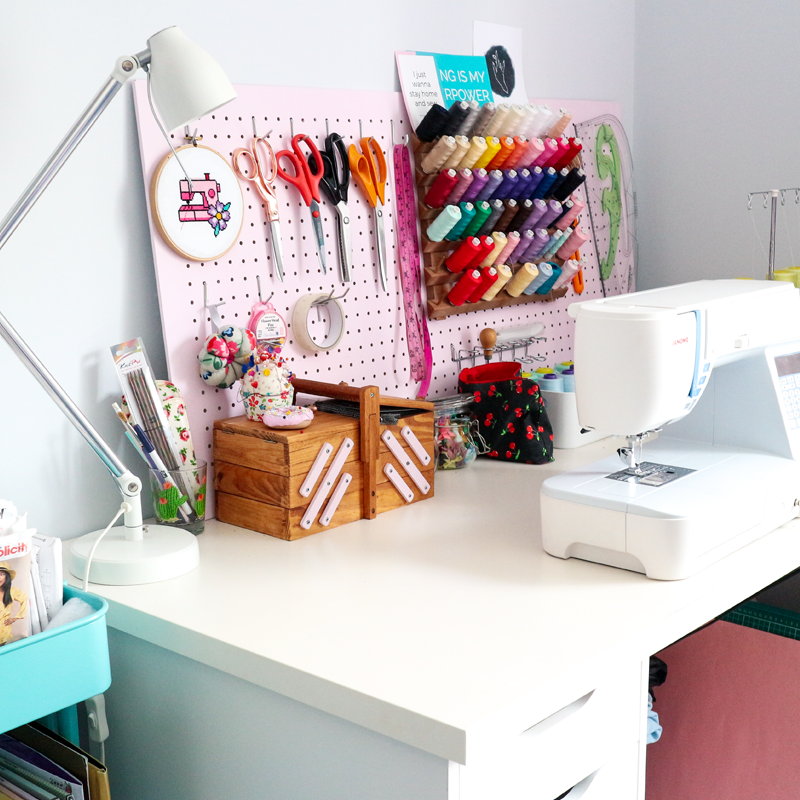 Last of the Summer days and lovely lighting in the sewing room! 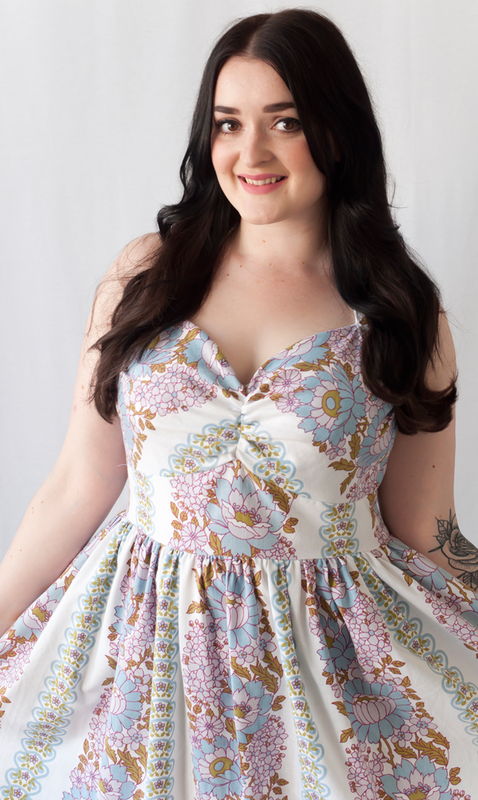 I just wish I had made this dress earlier on in the Summer so I could get more wear out of it! But it feels like Autumn is well and truly on it's way! (not that I'm complaining, it's my favourite season). Notions: Interfacing and a 16" concealed zip. Sewing time: A day, with tea breaks and trying on for altering the fit. Modifications: Details above in my pattern hack instructions. Watch out for: Getting the gathers even in the skirt. And making sure the halter neck tie is turned out neatly, and lots of ironing. Make again? : I'd definitely try this again. I'd like to try the classic halterneck versions as I love the retro collar and peplum options and think they'd be great with skinny jeans. Overall, I'm really happy with my Simplicity Sewing Challenge Vintage Make! 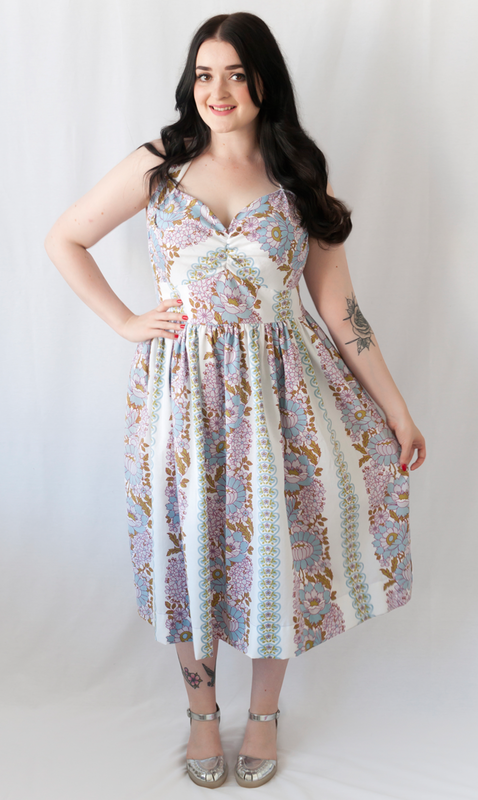 The pattern is a very welcome edition to my stash and it lends itself perfectly to my 50s Summer dress style. Along with my vintage 1970s fabric, it was meant to be! And for a total of around £12 to make, I'm really happy with my dress. 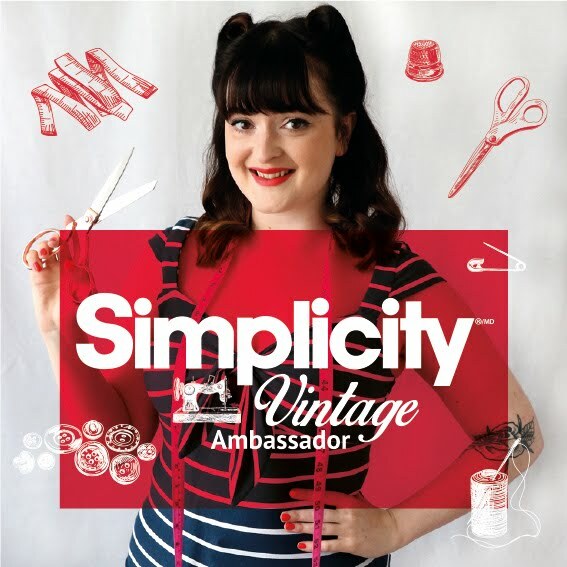 Thank you so much to Simplicity for having such an awesome sewing challenge, it's been so great to see what everyone's done with the same patterns! 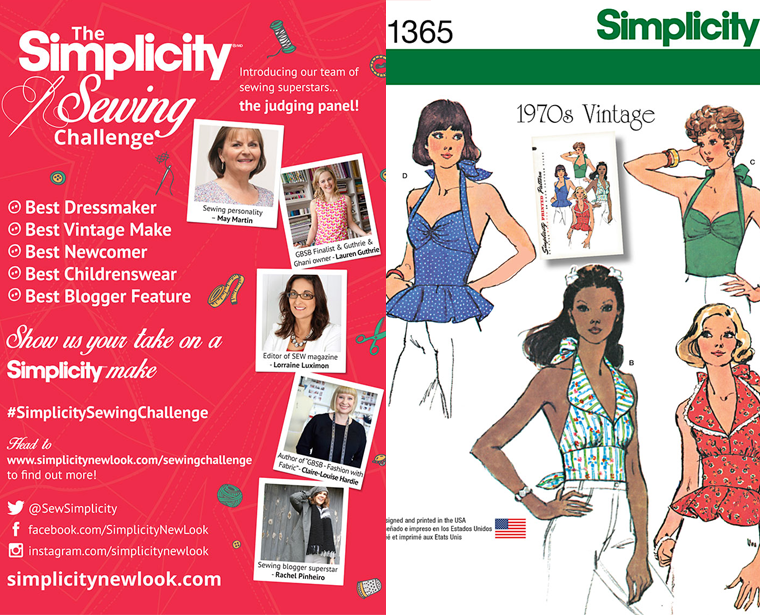 Did you take part in The Simplicity Sewing Challenge 2016? I hope you like my version! Thank you for reading, and let me know if you try this pattern hack. 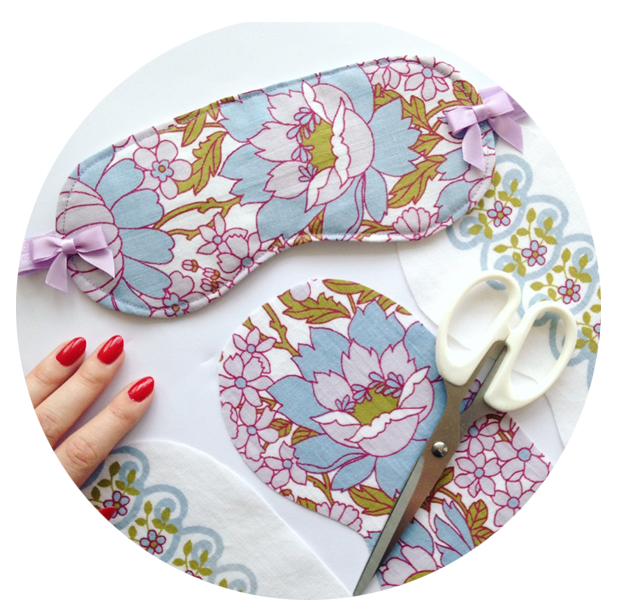 I had a little of my 1970s fabric left and decided to whip up a few eye masks as it seemed such a shame to throw it away! I managed to cut out about 10, so if anyone's interested, I'll make them available to purchase? I've been wearing mine nearly every night since I made it! The fabric looks perfect with the satin lilac bows and elastic. 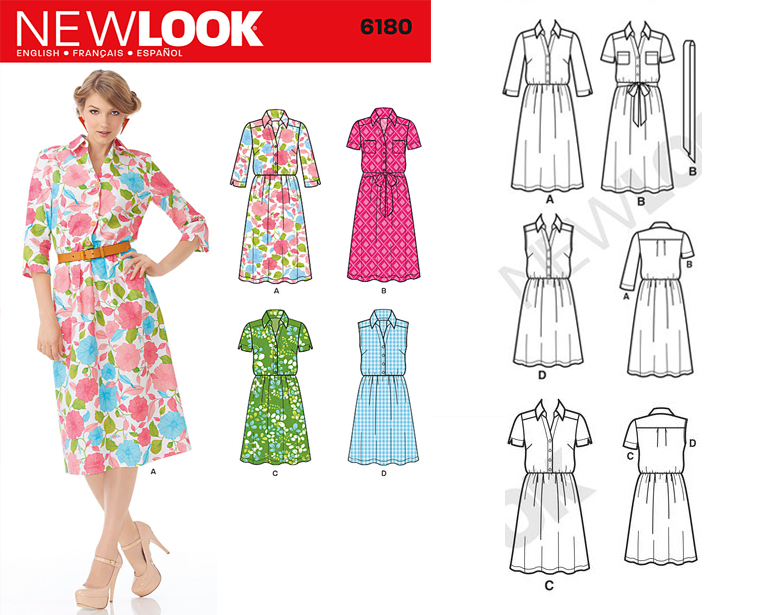 Simplicity New Look 6180 - #Ginghamalong Shirt Dress! 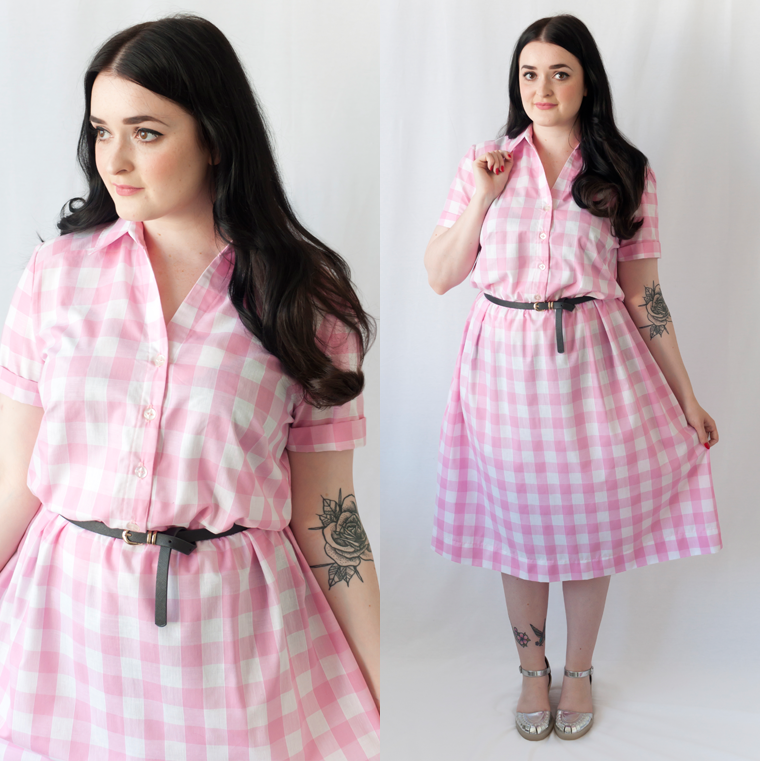 My finished Simplicity New Look 6180 Ginghamalong Shirt Dress! 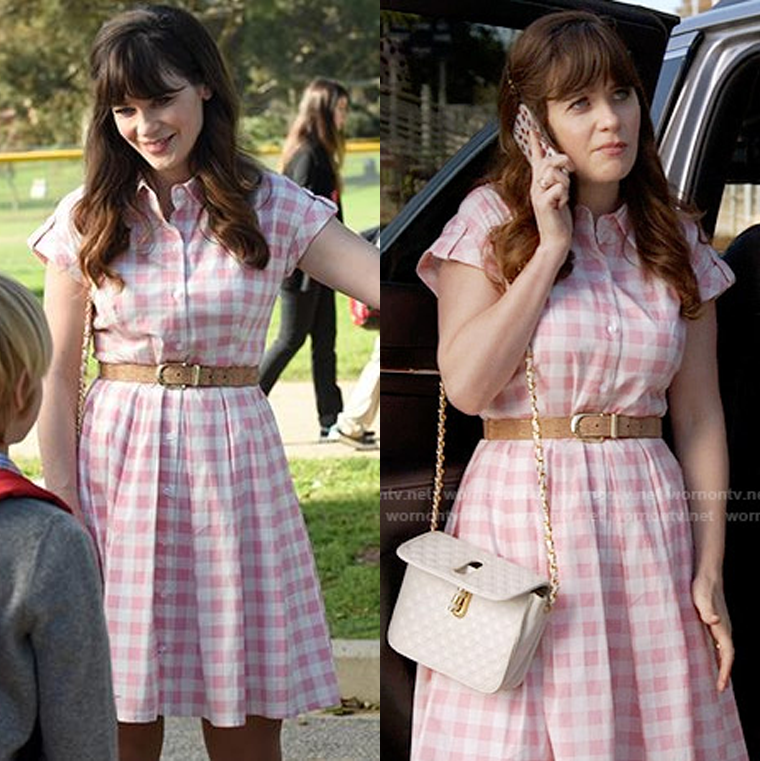 The ginghamalong coincided perfectly with me catching up on New Girl episodes and spotting Zooey Deschannel wearing a gorgeous baby pink shirt dress, which I was desperate to recreate. 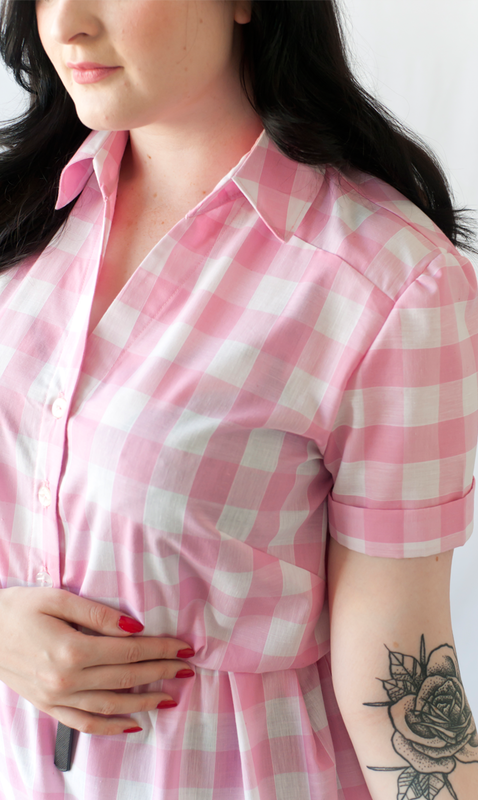 I also had this Simplicity New Look 6180 pattern unused in my stash that I thought would be great to recreate Jess's gingham look. Gorgeous, right? 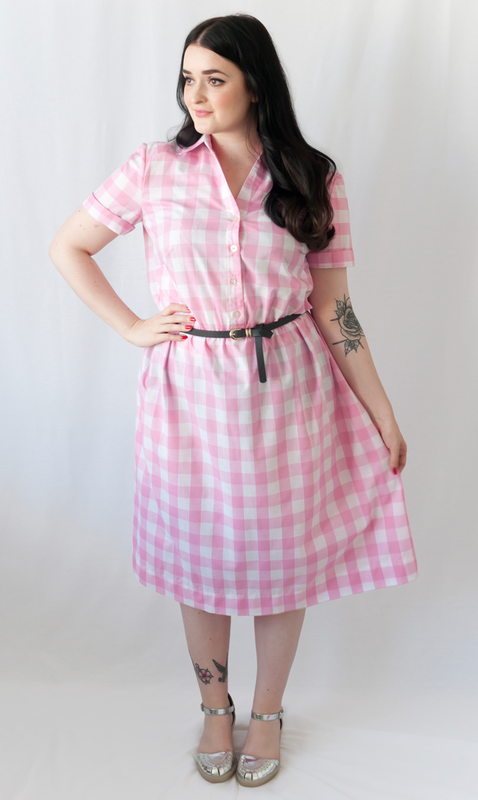 With a fabulous shirt dress pattern already in my stash, and with gingham cotton being so affordable, I went full steam ahead on this make! Hoping to get some wear out of it before Autumn truly arrives! And there will be many more in my sewing future! Including more of this 6180 pattern - which I loved making! So lets talk about this dress! I bought the pattern about 5 years ago but was yet to use it. Now I wish I used it sooner! It's a great, simple pattern and I love all the variations you can try. 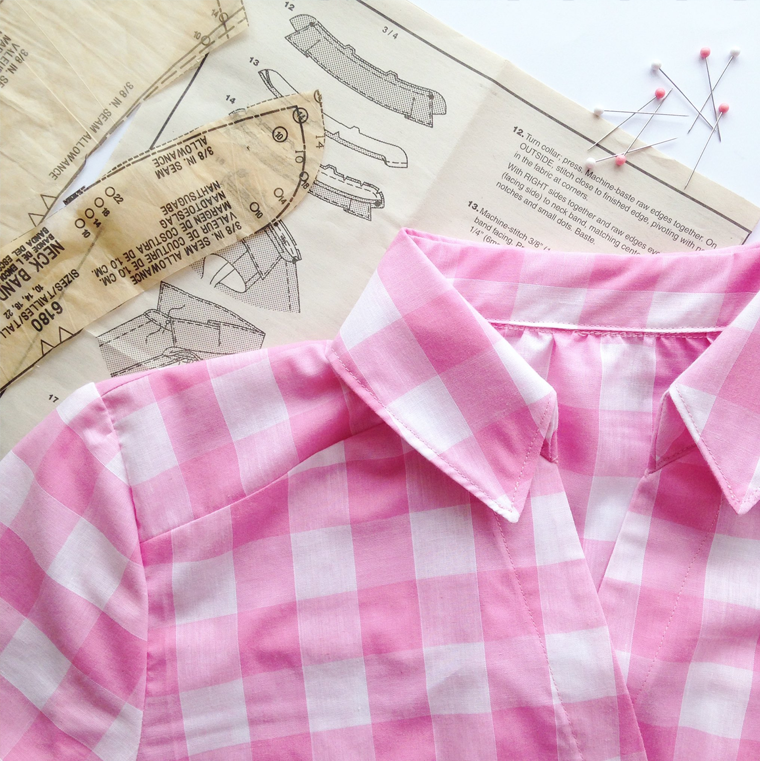 The collar is small and reasonably straight forward & great for collar sewing newbies. There's only 4 button holes, so again, great if this is a new technique for you. And there's a easy elasticated waist, making this a super comfy, cute dress. 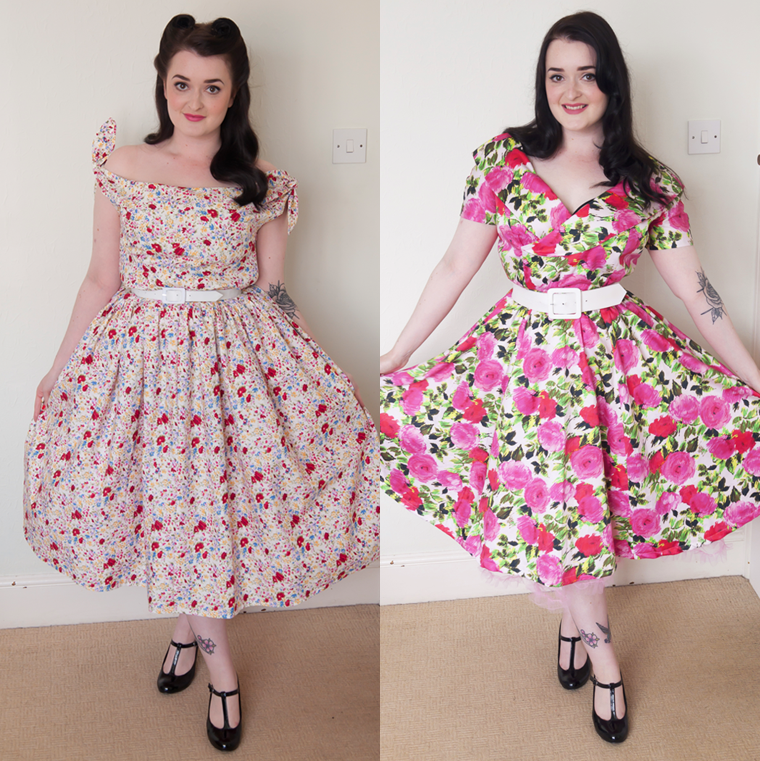 All of this, plus not taking long to sew, makes this pattern right up my street! I used 4 vintage buttons from my Grandmother's extensive button stash! I love the sharp little shirt collar, I spent a lot of time (for once) ironing it, getting the point sharp and making sure the top stitching was neat. I'm really happy with the outcome. I made the sleeves a little longer as I love rolled up sleeves on a t shirt dress, so added an inch or so the the sleeve and folded it up twice and ironed in place. Of course, it wouldn't be true to me if there wasn't a bump in the road.... The fit. Again. This dress is too big for me. I didn't notice how big until I tried the finished dress on. It's very baggy around my waist and sides but fits as I would like across my bust. Again the bodice is too long but that's my fault for not shortening it, as my short torso isn't exactly news to me. A tailors dummy is at the top of my shopping list! I still love this dress but without a belt it looks like a sack. 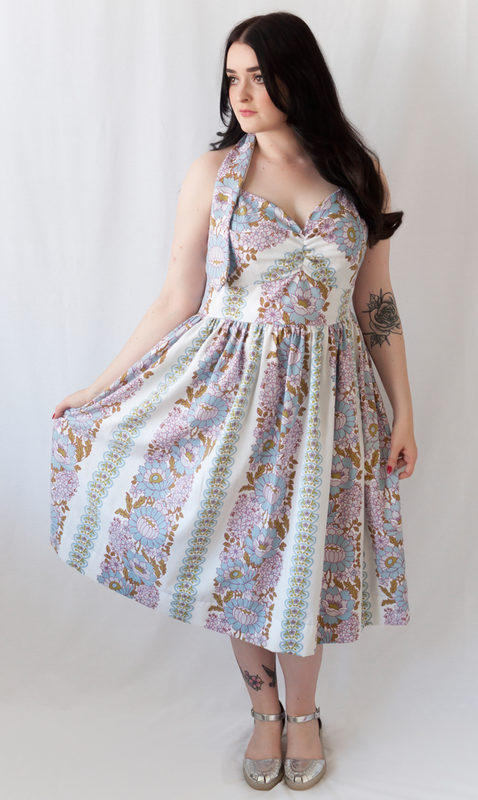 However, I really love this pattern and will be making another one asap as I know I'll live in it. I'm going to cut a size down and shorten the bodice about 2 inches. 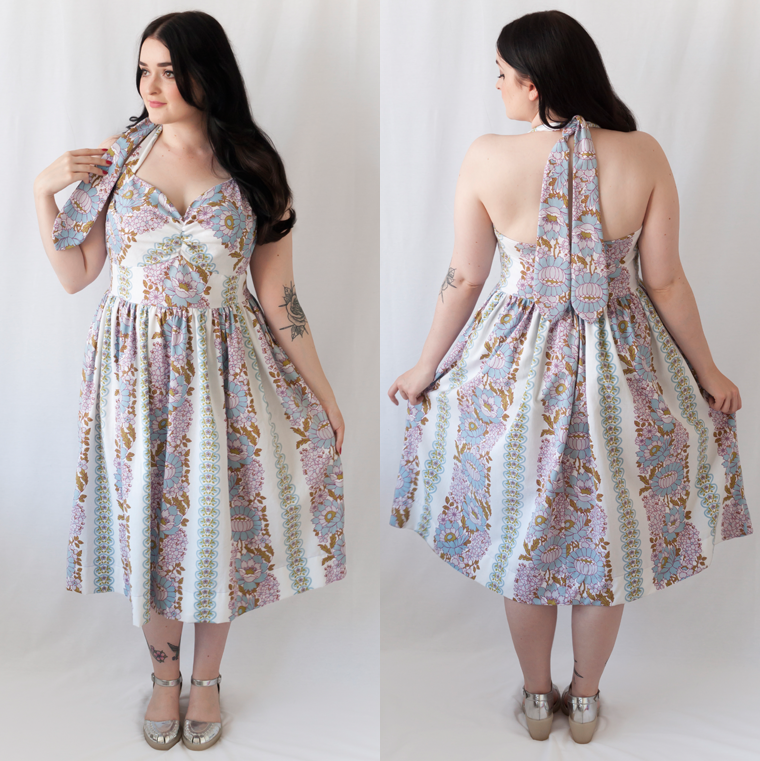 I'm also tempted to try the bodice with a different skirt, it's not full enough for my tastes and I love a gathered skirt with pockets, so I think I'll be trying that with my next one. Notions: Interfacing, thin elastic for the waist and 4 buttons. Sewing time: Half a day. Or a full day with tea breaks/dog cuddle breaks. Modifications: Lengthened sleeves for rolled up finish. Fit: Too big everywhere but bust. Watch out for: The collar and button holes. But if you're a first timer at these techniques, this is a great pattern to kill two birds with one stone! Make again? 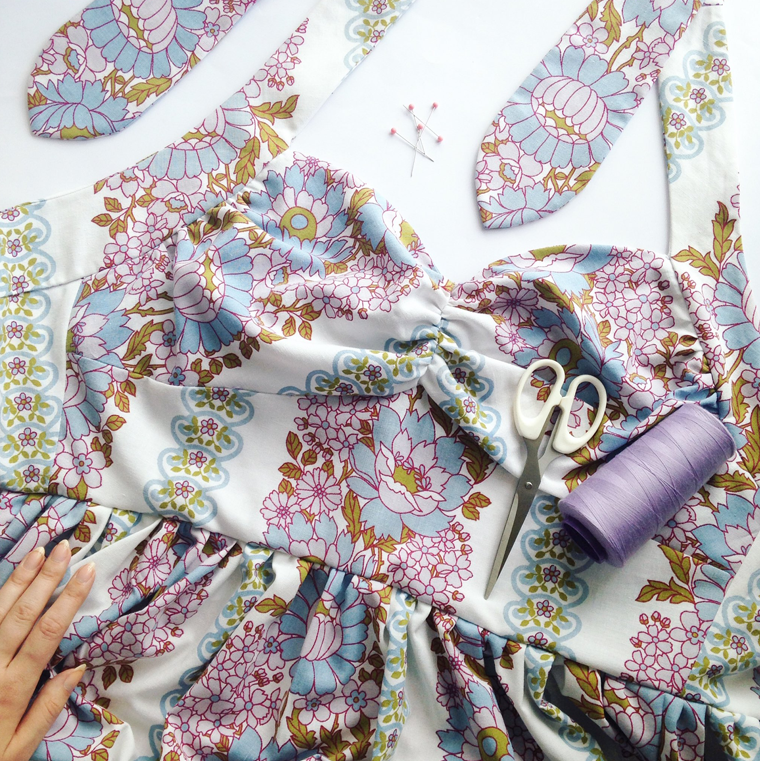 : Yes, I'm making this dress again with better fit asap, so stay tuned for 6180 No.2! Overall, I'm really happy with this dress but just annoyed with the fit. More annoyed that these were things I should of known to change already! However, with a belt to define the waist, I love this dress and can't wait to make more. I think it'll be a great style for Autumn with tights and boots and my leather jacket! Have you tried this pattern? I'd love to see your take on it!